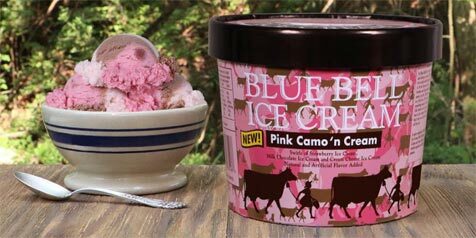 On Second Scoop: Ice Cream Reviews: Blue Bell announces new flavor Pink Camo 'n Cream! Blue Bell announces new flavor Pink Camo 'n Cream! BRENHAM, Texas, September 7, 2017 - The newest flavor from Blue Bell Ice Cream is guaranteed to stand out in the ice cream aisle, despite its camouflage pattern. That’s right, the 110-year-old ice cream company is introducing a sidekick to last year’s popular Camo ’n Cream Ice Cream with its new Pink Camo ’n Cream Ice Cream. Pink Camo ’n Cream is a tasty combination of Strawberry Ice Cream, Milk Chocolate Ice Cream and a cream cheese ice cream swirled together in a camouflage pattern. The flavor that started it all, Camo ’n Cream Ice Cream, is a combination of Pistachio Almond, Milk Chocolate and cream cheese ice creams. Some consumers have been intrigued by the cream cheese ice cream. By itself, it is sweet and many times served with strawberries or other fruits to enhance its flavor. And, it complements other ice creams like Strawberry, Milk Chocolate and Pistachio Almond. Pink Camo ’n Cream and Camo ’n Cream are both available in limited quantities in the half gallon and pint sizes. For more information about Blue Bell and for a list of flavors now available in stores visit www.bluebell.com. Dubba note: I'm posting news in the main feed now but reviews will always take precedence. I used to see Blue Bell at Wal Mart, but I never see it there anymore. I have trouble finding it these days ever since the ice cream recall it had a few years ago. So it like Neapolitan ice cream but all swirled together? I tried a pint last and was not impressed. Both the chocolate and cream cheese flavors were disappointing. It was pretty, though!